It primarily comes down to symbolic independence. 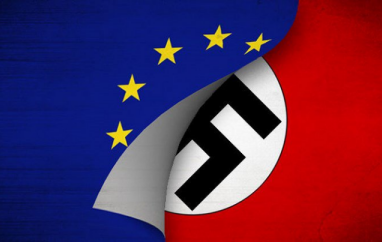 The silent majority very likely look at the EU flag and see this underlining feature. Brilliant...you've nailed it . Herr Juncker , Herr Barnier, und Herr Tusk sprechen Deutch ja..unter Frau Merkel. Brilliant observation! They all speak English too. And French. And Tusk has Polish. What language, other than English, do you speak? Obviously not German to judge by 'unter Frau Merkel'. I fail to see what you mean by 'under Frau Merkel'! Remain and the Remainers are yet to make their case for a second referendum, in order for them to win a second referendum their going to need to convince people like you and I. and millions like us to change our vote to Remain. Question i want the answer to is what arguments are they going to use? we cant leave because its all far to complicated? we cant leave because there will be a recession, we cant leave as we'll loose 800,000 jobs? what exactly is their campaign going to be centred around? a rehash of the first? they cant use job loses as the economy since vote leave as seen an increase in jobs by 1million. cant use recession as the UK is growing faster and sustained growth longer than the Eurozone. and indeed its the eurozone whose heading for a recession. - are they going to say its a good idea to hand over £19.2bn plus a year, are they going to say its good EU law supersedes UK law as evident this week - that we the UK cannot leave the EU this Friday even if we wanted to as the EU have moved the date to 12th April and EU courts/laws superseded UK laws. plus our fishing grounds, Brexit takes back control,laws money everything and makes Parliament 100% sovereign - are they arguing we should hand all these powers back to a foreign power? why why why. I'm thinking that this deadlock will act as the basis for getting a 2nd referendum voted for through parliament.. If they manage to do this... the Leave Vote will be split and there's a good chance that they could swing it.. Here's the 'yoof' on their way to march in London. Careful Steve, it looks like enough of the ERG are folding to give May's deal including backstop a real chance of success. You wouldn't want to stop that at this stage would you? WA is worse than remaining and needs voting down for a third time. the ERG have said they'd only agree to the WA if the DUP agreed. The DUP is against the WA. as Mrs Mays Agreement locks us back into the EU for 21 to 45 months and may end up forcing us to stay in the customs union with alignment of laws, as well as threatening the integrity of the United Kingdom. As such ERG chairman Jacob Rees Mogg has said he could never vote for the Agreement all the time the DUP said it was bad for Northern Ireland, which they are still saying when I last heard them on the media 3hrs ago. excellent, read. been in my bookmarks for well over a decade. and because there warnings from History, we can determine if they were indeed correct. i leave it for people to judge. FFS why dont we just do the free trade agreement without a customs deal? Once outside the EU it cannot dictate to us, it cannot force us to erect an Irish border. If one is erected it will be their choice and then Ireland (not the UK) will be in violation of the Good Friday Agreement. In which case we should annex Northern Ireland properly. He's also on the record today saying the WA is better than no Brexit so which is it? DUP on the record today, saying they would accept a year's delay. RM on the record as saying he is moving towards Mays deal. Other ERG also have come out today to claim if given a third chance they would vote for it. Assuming the DUP don't split it will be very tight third vote. @stevewinn I would prefer not to have Brexit, and would prefer many options other than Mays deal. Ironically because of the backstop, the majority of people in NI would accept the WA. I think Rees Mogg will be swayed, he will argue that it avoids no Brexit, and well the people of NI are happy with it so lets go with it..
Once outside the EU it cannot dictate to us, it cannot force us to erect an Irish border. The point is that without the agreement both the EU and the UK would be leaving themselves open to challenge under WTO by a third country claiming that the lack of a border constitutes an unfair trading relationship. Hard border doesn't merely imply physical structure, in fact physical structures can be non existent and there could still be what is technically termed a hard border. Will the ira set off imaginary bombs. On the 29 march 2019 at 11pm i'm honouring the democratic vote and leaving the EU, Fu(k the cowardly traitors in westminster. Any news on the British passport fiasco? Many people here in Northern Ireland have Irish passports and cross the border regularly for work. Will they be forced to change and will this affect their employee status at work when crossing the border i.e. recognised as a foreigner and not protected by EU laws and permits? There have also been record numbers of citizens applying for Irish passports here because they fear that it will not be possible in the future to apply for one locally in NI after Brexit, and I know a number of colleagues at work who are renouncing their British passports and switching to Irish instead because they want to continue to receive all the perks and benefits that come with travelling abroad as an EU citizen so that they have peace of mind when on holiday, living, working, or retiring abroad. Should I keep my British passport or apply for an Irish one? I wish we had an immunity. Problems like this will only create greater division in Ulster. Should I keep my British passport or apply for an Irish one? Get an 'Irish one', and we won't let you back in. Around 600 thousand citizens here in Northern Ireland already have Irish passports. Will they all be issued British ones, and owing to the unfortunate distrust and dislike that a number over people in NI have against the British, they probably will refuse a British passport even if they are issued to them for free. Or at least one assumes they would. The number of applications appears to be rising very quickly. There are more than half a million residents in NI with Irish passports. I think we can guess they voted for Remain to win, and the sharp increase will mean a sharp rise in Remainers voting in the second referendum (assuming the next government calls for one). Could Brexit be killed off by the increasing Irish vote? 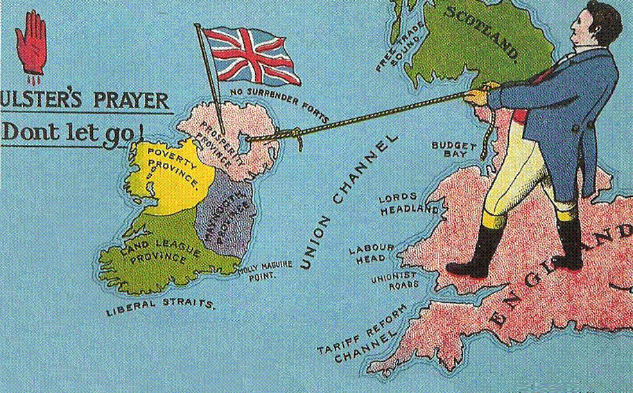 The struggle between the DUP and Theresa May to keep the Union together reminds me of this picture from 1912 during the home rule crisis. Is this Gov't now reneging on the Democratic vote to Leave the E.U. on March 29th , if so they are breaking their own law , so Democracy his gone down the pan . When the guerilla war starts by the Brexit people , They will do whatever it takes to bring back Democracy to the U.K. they really don't know what they are starting . Can they imagine even half of the 17.4 leavers putting up with this . We're told don't use violence (we all say it) use democracy, deal with it at the ballot box, well we've done that spent years doing it, where do we go from here? Dabbing porridge on Remainer M.P's car windscreens is not using violence LOL . Does tha knaa Mackem bonny lad , hadaway doon the lonnen an cowp ya creels ah divvent have ta tell yee warra knaa . IAny news on the British passport fiasco? Many people here in Northern Ireland have Irish passports and cross the border regularly for work. Will they be forced to change and will this affect their employee status at work when crossing the border i.e. 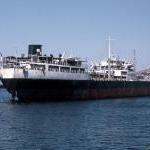 recognised as a foreigner and not protected by EU laws and permits? 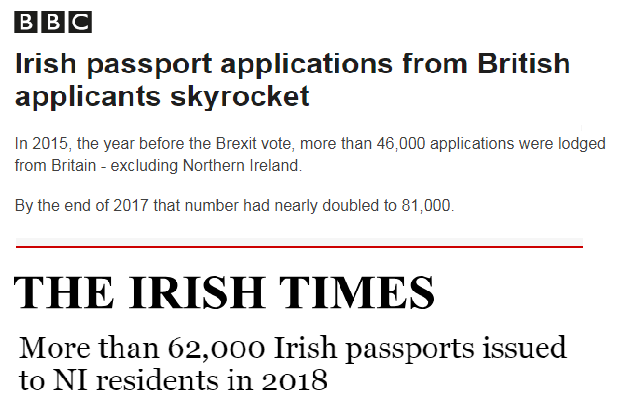 There have also been record numbers of citizens applying for Irish passports here because they fear that it will not be possible in the future to apply for one locally in NI after Brexit, and I know a number of colleagues at work who are renouncing their British passports and switching to Irish instead because they want to continue to receive all the perks and benefits that come with travelling abroad as an EU citizen so that they have peace of mind when on holiday, living, working, or retiring abroad. You do not have to renounce anything. You are entitled to dual Citizenship. As part of the good Friday agreement you can be British Irish or both. That's why so many people are getting them. They are not breaking the law, they are changing it.